35mm tubed ceiling to floor fixed pole with flange fixings in either plain, part or full ribbed surface finish. 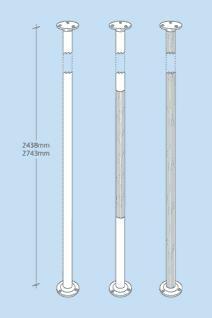 2438mm and 2743mm sizes- but these can be cut down to your required size with a good quality hack saw on site. Be the first to submit a review for the Vertical Grab Poles - Stainless Steel.